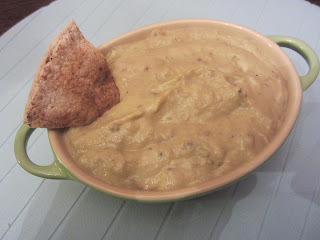 Smoky, creamy eggplant dip. Thick and smooth, I don't want to knock hummus, but when I'm served hummus and baba ghanouj on the same plate, it's the eggplant dip that goes first. 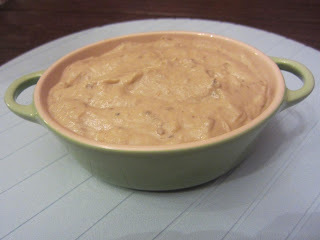 And, much like hummus, baba ghanouj is really easy to make. Even better than hummus, baba ghanouj is really easy to freeze, so you can have the goodness of eggplant season whenever you need it. But I'm not being fair to hummus, and that's not why we're here.Baba ghanouj is typically what I make when I'm afraid an eggplant isn't going to last long enough to use in something else. It's easy to bring with some pita and a salad for lunch. And, as above, it freezes. I could see the merit in roasting garlic for this, but at the same time, that means its 40 minutes longer - with a hot kitchen - before the baba ghanouj is ready. So I don't go as far as roasting it until it's smooth and nutty. 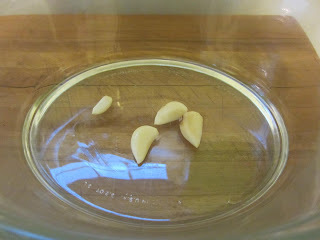 If you have pre-existing roasted garlic, this would be a great time to use it. Instead, I toss a few cloves into the oven while I'm prepping my eggplant, and leave them in the while I bake my eggplant. It all works out. The real action starts off with a mess on my stovetop. Just like when I'm grilling corn or roasting a red pepper, this takes place right on my gas burner. 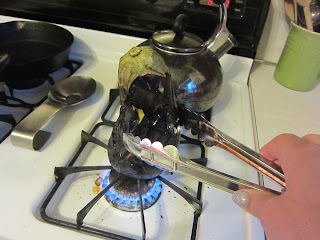 If you have an electric range, or are just horrified at the prospect of doing this, you can go outside and grill it. What you want is for the eggplant to take on some smokiness. You'll finish cooking it in the oven. 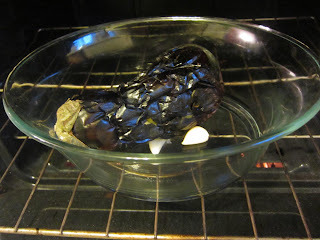 Place a whole, washed eggplant right on your washed burner. Turn the stove on. Use tongs to rotate the eggplant and make sure that it's not on fire. After about 10 minutes, depending on the size of your eggplant, it should have sort of collapsed. It'll be difficult to attack with tongs. This is when you put it in the oven, to join those garlic cloves from earlier. Give that 20 minutes to a half hour in the oven until soft throughout. 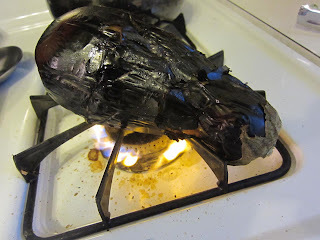 You might want to spend this time cleaning your stove. 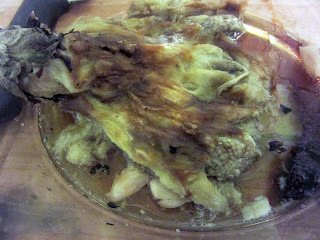 After the eggplant is done cooking, take it out and set it aside to cool. You want it to be comfortable to touch. While it's cooling, if you haven't already, you might want to use that time to clean your stove. Once the eggplant is cool, regardless of the condition of your stove, peel the skin off and discard it. Dips, like salad dressings, aren't all that pretty, so if you're someone who might get upset at an eggplant that's all smushy, don't look. Ok, you can handle it, right? Cut off the green part at the top of the eggplant and take the eggplant and the garlic and put them in your food processor or mini chopper or blender. 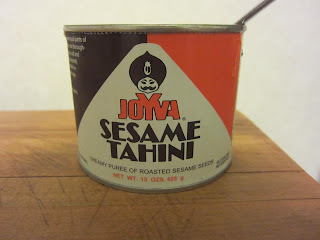 I'm not a huge tahini fan, and I use considerably less of it in both my hummus and my baba ghanouj than other recipes call for. If you do it my way and find yourself missing that sesame goodness, just add more. It's a pretty flexible recipe. I add two tablespoons of tahini per eggplant. Whirr that together in the chopper or processor and see if you need more. 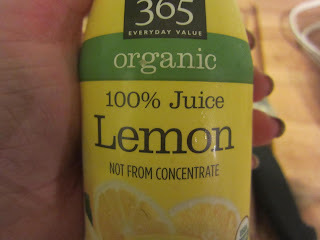 And if you have a lemon on hand, that's way better, but I use a tablespoon of this stuff. Also, olive oil, cumin and salt, which somehow managed not to be photographed. Start with a tablespoon of olive oil and add more if needed. Some people garnish the top with olive oil but I don't think that's necessary. I used a quarter teaspoon of both salt and cumin. Then whirred it again in my chopper. This made enough to be a hearty side dish in four lunches, or an appetizer for eight or so. Turn oven to 350 and add garlic to a pan large enough to hold the eggplant. Cook the garlic during next steps. 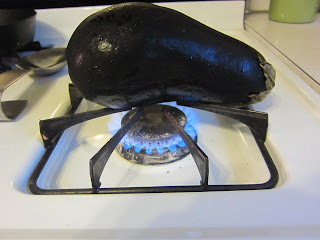 Roast the eggplant over gas burner or grill, turning frequently until it loses it's structure. Finish in oven with garlic (20-30 minutes, until very soft). 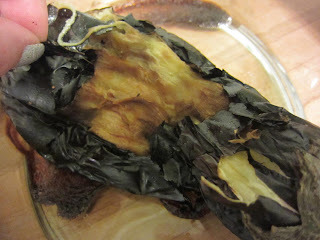 Let eggplant cool to the touch and then peel and discard skin and stem. 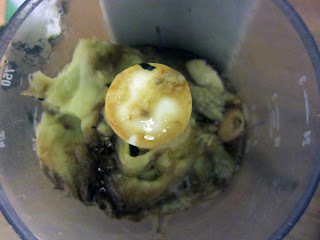 Blend eggplant and garlic in a food processor, blender or chopper. 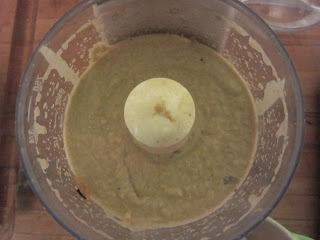 Add two tablespoons of tahini and blend. Check texture and add more if needed. Add two tablespoons of olive oil, a tablespoon of lemon juice, and a quarter teaspoon each of salt and ground cumin. Whirr in processor until smooth and combined. Serve cold or at room temperature with pita bread or crackers.